El Paso and all of it’s surrounding areas are served by 5 specialized VA Realtors who can help you turn your Texas VA home loan into the home of your dreams. Not including the active 34,000 active duty personnel at Fort Bliss, El Paso has almost 43,000 veterans. 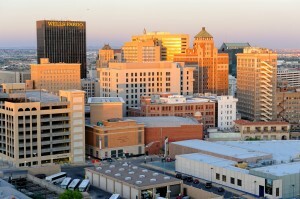 As the 6th largest city in Texas, El Paso is one of the main focus areas in the state. If you are ready to meet your El Paso VA Realtor, press the “get started” button on this page, fill it out and submit it. You will get a call from a VA specialist the same day to get you set up with your El Paso military specialized real estate agent. While we are on the phone with you, make sure you let us know if you need a loan and we’ll have an El Paso VA home mortgage lender call you at your convenience. Although we are a real estate brokerage we have a network of top notch VA approved lenders to get the job done. If you are just starting the process and don’t know what to do, let us know. That’s what we’re here for! Many of our clients are first time home buyers. Your Texas VA home loan can be used to purchase an existing home in El Paso, a new home or an approved Condo. Our affiliate Realtors have access to all listed houses in the El Paso MLS. Once we have helped you decide on the perfect home, it will take between 30 to 45 days to close. We cover all of El Paso and its outlying areas. USVA Realty provides services as far North as Westway and as far south as Fabens and all of Horizon City and Homestead Meadows. Get Started and let us help you today. Find out more about your VA home purchase using your local El Paso VA Realtor.